Flying down Thud Ridge at just below the speed of sound, Jack Broughton leads an F-105 Thunderbolt raid on the power plant at Viet Tri, North Vietnam, March12, 1967. The target was destroyed. 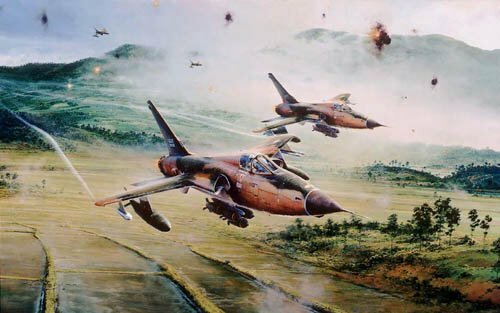 Each print is signed by four of the U.S. Air Force's most distinguished and highly decorated F-105 pilots who saw combat action during the fiercest air fighting in North Vietnam.